This 12ft Tall Exhibit Tower Display SEG Systems is tall and wide providing huge advertising space. The 4 sided display allows your message to be seen and admired from all angles and at greater distances. Tradeshow towers are an excellent choice for island exhibit booths, set them up right in the center and have plenty of room all around the perimeter form counters, product shelf and handout holders. You can store items insides by opening up a corner of the graphic the push fits back in place. 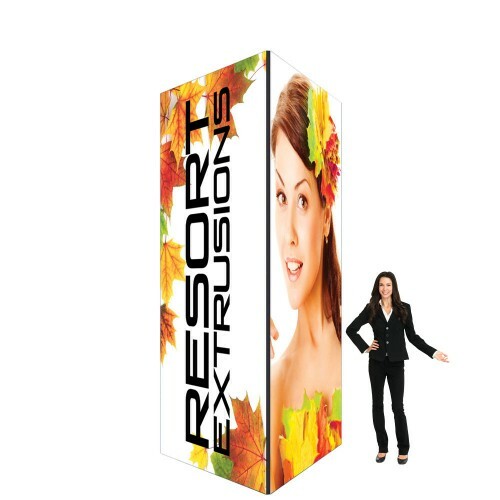 With this tall size we suggest checking with your tradeshow venue to make sure this meets any height restrictions, we do offer shorter versions. About the Tower Graphics: The tower exhibit SEG system holds 4 large print fabric graphics for each of its 4 sides. The banners are custom printed with dye sublimation for photo quality prints with deep rich colors that POP. The Silicone-Edge Graphics (SEG) fabric graphic has a silicone edge beading that push fits into the frames recessed groove. This creates a taut smooth edge to edge graphic surface to display your marketing messages.